On your brand-new prototype, ask Alexa what's the weather. She probably doesn't give you the exact response you were hoping for. At this point, the Alexa Voice Service doesn't know where your device is. If you wish to know your local movie times, weather, or other location-specific information, you'll first need to access your settings menu by opening a web browser on any device and navigating to Alexa.amazon.com. On a commercial product, your customer could also specify this in the Amazon Alexa App on their phone. Navigate down to the Settings tab and select the device you created. You can identify it by your unique Product Name you created earlier, which for this tutorial may be AVS Tutorials Project. If your sample app is still up and running, you should see status as "Online". Select your device, and change the location by Zip Code to whatever you prefer. You don't need to restart your sample app to see the change. As soon as you update your settings in the cloud, you'll receive data for that location. Try asking Alexa what the weather is again and see where your device is now "located". Feel free to click back on your "Home" tab on the left-side menu of Alexa.Amazon.com. You'll find a lot of interesting settings to experiment with. 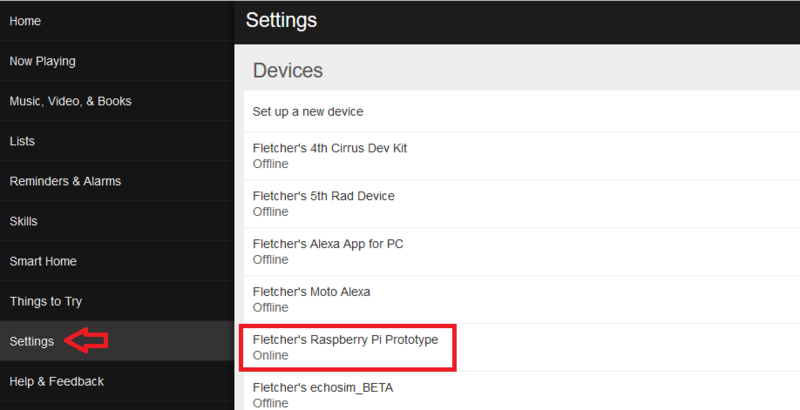 When you're ready to do more with your Alexa-enabled prototype, check out the Advanced Pi Tutorials!